As many WindCheck readers know, our editorial staff produces the Block Island Race Week News for the Storm Trysail Club in odd-numbered years. In 2007, we were particularly interested in watching a Wyliecat 30 named One Up, owned and skippered by Lincoln Schoenberger of Shelton, CT and competing in the PHRF division. We’d seen this blue 30-footer at the Park City Regatta, a breast cancer charity event hosted by Fayerweather Yacht Club in Bridgeport. We admired her handsome lines and the simplicity of her free-standing, single-sail cat rig (hence her name), and were impressed with her speed. At Race Week, we spoke enthusiastically about One Up aboard the Rolex Media Boat, and were surprised one morning to find her apparently bringing up the rear of the six-boat PHRF 5 class. A colleague even commented, “Gee, your buddy’s not doing very well.” Our captain had just driven us to the PHRF race circle from another, and it wasn’t until the day’s score sheet was posted that we realized One Up had already completed the first windward and leeward legs of that race and was poised to overtake her rivals…all still sailing the first beat! Linc is especially keen on sharing his passion for sailing with young people, and the Cedar Point YC Junior PHRF Team has sailed One Up in the Dorade and Beach Point Overnight races with him aboard as safety advisor. A photo on the CPYC website, taken in 2005, shows Linc and several young sailors wearing tiedyed One Up t-shirts. Linc’s Facebook page also reveals that one of his Music favorites is Ry Cooder, a slide guitar virtuoso known for an acerbic wit. 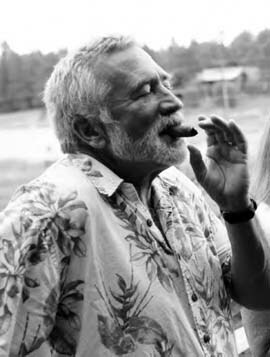 We relish the thought of youthful ears being introduced to classic Cooder albums like Paradise and Lunch and Chicken Skin Music (each recorded, in all likelihood, before most CPYC juniors’ parents were born) during those overnight races with Linc, naturally, savoring a fine cigar. If more young people had an opportunity to sail with such a hip, enthusiastic mentor, the future of our sport would be bright indeed.